Much progress has been made on the garden. You might notice in the photo above that we have a gate! And it’s not just propped in place. It’s actually on hinges, and it swings and everything. 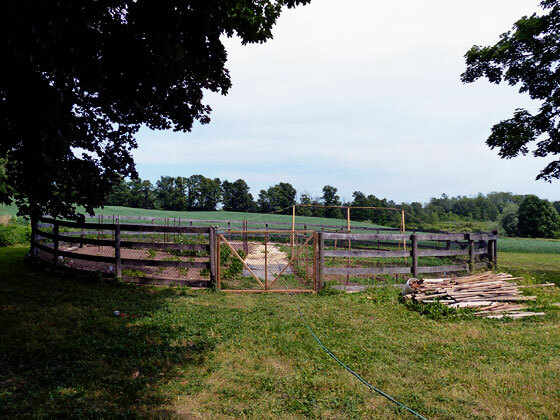 It’s only been 10 months since I built the gate. Not at all unreasonable to wait that long to fully protect the garden, right? Inside, things are slowly filling in. I’m trying to remind myself to be patient and things will grow… eventually. Let me take you on a tour of around our garden as it’s growing right now. Quadrant one is our most well-established. 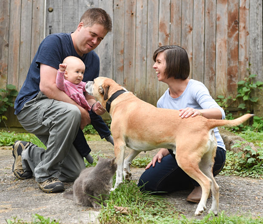 It is home to five rows of potatoes–three red, one Kennebec and one Russian Blue. Although I really could have done two Russian Blues given how many we had and how much space there is in this quadrant. There are also three zucchini plants. 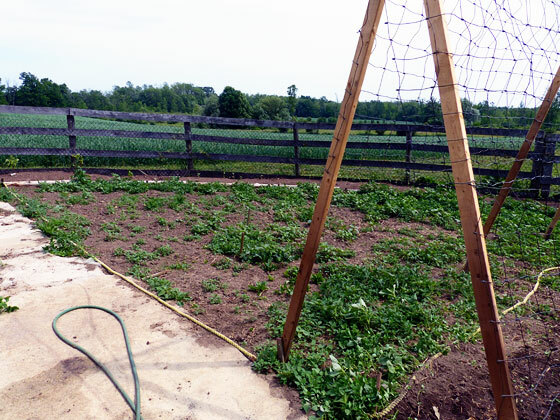 Then in the perimeter beds there are onions, beets, carrots and a selection of herbs. I’m a bit disappointed in the onions. They are spindly, some of the ends are brown, and I’m not confident that they’re going to size up. But I keep watering them and sowing new rows for my attempt at succession planting. (The beets in the background are doing excellent, however). 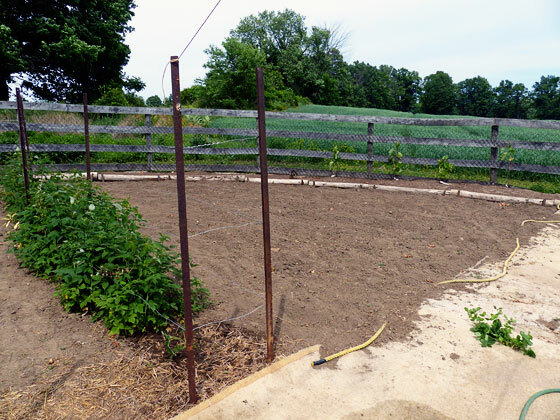 Quadrant two is bordered by our perennial crops: raspberries, grapes and asparagus. The middle is empty however, and we don’t have plans to plant anything here. One of the things I’ve realized is that we can only handle so much with this large vegetable garden. 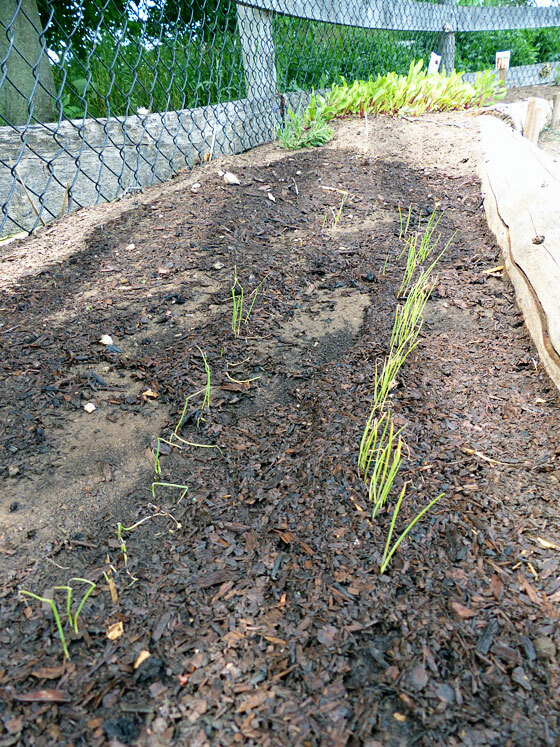 The asparagus isn’t that much farther along than the onions, but I’m beyond excited by it. 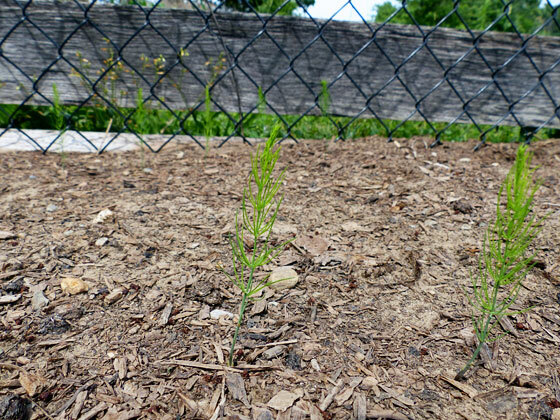 I’m trying to grow asparagus from seeds, and I thought I wasn’t going to be successful. These seeds took so long to sprout. Almost three weeks. I thought it wasn’t going to happen. So these little tiny ferns are tremendous progress. Quadrant 3 has a lot of growth, but not the kind I want. Welcome to weed central. Ugh. There are some watermelon seedlings in here, but I’m not sure they’ll last that much longer without some defense. The outside edge has our sunflowers which are growing incredibly. Quadrant four is slightly better than weed central, but not by much. This is our first year planting this half of the garden, so it’s taking more effort to clear out the weeds on this side. 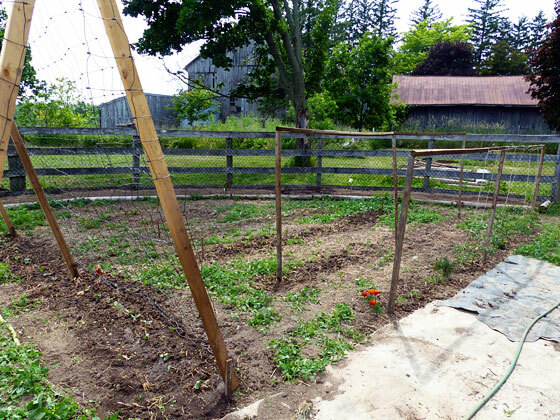 In this quarter we have two rows of tomatoes (under the wood frames), one of peppers, one of beans and three more zucchini plants. The outer edge has some more herbs, more sunflowers and our hollyhocks. You’ve caught glimpses of the centre axis already, but here’s the view that I’ve been working towards for the past two years. 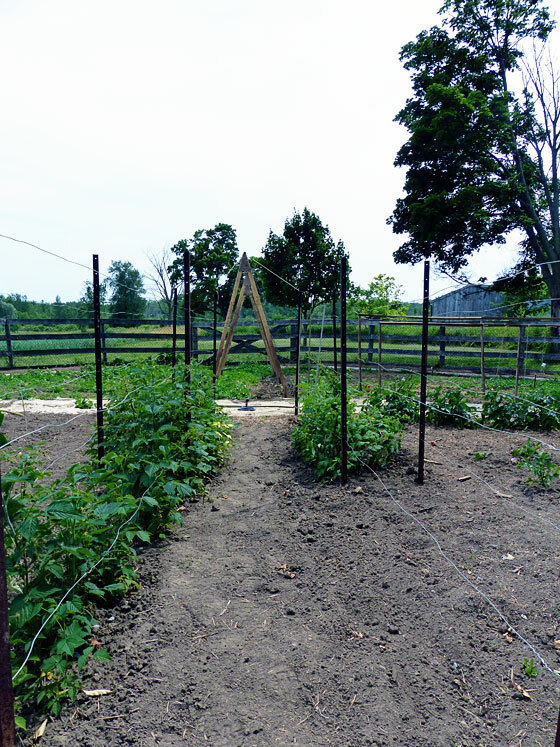 A long look between our two rows of raspberries, through the squash A-frame and out to the back fields. On Monday I posted about vision. 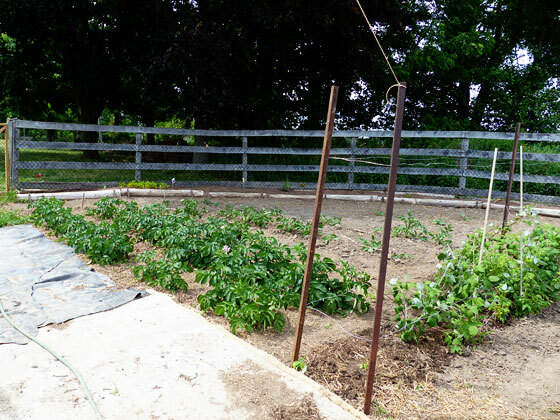 The vision for this vegetable garden has been a long time coming, but it’s oh so wonderful to see it come to life. It is so wonderful to see your progress. The garden is really coming along. You give me hope for my own future garden in a cold climate. Oh it’s totally possible in a cold climate. I’m not sure my watermelons will agree, but lots of other things have enough time to grow! The garden is coming along beautifully. What a lot of work you have done to get it from a weedy paddock to this! It should hopefully get somewhat easier as the years go by. I’m looking forward to seeing those hollyhocks and sunflowers as well as all your veggies. Will you harvest the sunflower seeds? That’s the plan! We have two varieties, one that’s more of a cutting variety and the second that are called Mammoth Russians. I’m hoping to never buy birdseed again! Glad to hear I’m not the only one, but I’m still hoping they’ll rebound. I love your garden! I want to have a coffee and sit there amongst the plants! You mentioned how you have an empty section but already so many veggies, and I had a similar problem. I found my veggie garden was getting to be too large for me to manage, so I ended up changing one of my garden beds into a cutting flower bed. Turns out, besides some weeding, there’s less maintenance in that I don’t have to replant every year. I live in Seattle area, so we don’t get the snow you do, but I figured I would mention it since we are both in cooler climates. Thanks for sharing, jess. I’m glad to hear that your cutting garden has worked out so well. It’s something I’ve been considering more and more especially since I’ve added sunflowers and hollyhocks. Giving over a whole section or incorporating flowers throughout adds something very special, I think.